Do I Have To Be A Certain Age To Have A Cheek or Neck Lift? The answer to the age-old question of when to have a mini facelift is entirely personal. There’s no right or wrong time to schedule a cosmetic surgery procedure during your lifetime, because everyone reaches acceptance at a different moment. This could include a twenty-something who inherited a genetic trait that they feel negatively affects their face (and subsequently lifestyle, relationships, career, etc.) to a 75-year-old who is finally ready to turn back time and live the remainder of life with newfound confidence. At Smith Cosmetic Surgery, we don’t subscribe to a standard age for our facelift patients. Our goal is simply to help guide people in choosing facial plastic surgery for the right reasons, rather than just focusing on the right time. In fact, in most cases we find that people have already come to the decision to have a mini cheek and neck lift and just need some support to take the next step. Some cosmetic surgery patients have struggled with body image and confidence issues all their life; while others have undergone a significant life change or transition that led to the decision; and still others come in with a loved one to support a choice they’ve wanted to make for a very long time. Every time the decision is different; and every time it is personal. It’s our job at Smith Cosmetic Surgery to set realistic expectations and make a custom plan for each facelift—and every person. The more stories we can share about the very different types of people—at very different stages of life—that Dr. Smith has treated, the more we find that others considering plastic surgery can relate and uncover their own courage to come in for a complimentary consultation. One scenario that may sound surprising, but is more common than people realize is someone younger, perhaps even in his or her late 20s, who comes in to discuss facelift options. Often these young patients, due to no fault of their own, are endowed with unwanted facial features, such as a mouth that appears to frown even in a resting state. As you can imagine, such a perpetual negative appearance may have started to affect self-confidence, especially in a professional setting. For example, if you’re building a career in sales, a position that requires a majority of face-to-face work, having a facial structure that pulls the mouth into a frown could be highly detrimental to communication. Not only is it personally frustrating to have to hide the look of a heavy jowl area and not be able to express adequately how you feel on the inside, but also an unwanted scowl may start to weigh on your entire professional life. And while it’s easy to judge someone in his or her 20s as too young for a facelift, we know that’s unfair in the practice of facial plastic surgery. If any individual is struggling in life due to outward appearance, we want to alleviate that burden by crafting a custom mini lift to draw up an undesirable pout while highlighting all angles of the patient’s youthful characteristics. In another scenario that happens quite often these days, men and women are finding themselves back on the dating scene in the middle of their life. This can put a new emphasis on appearance that may have fallen by the wayside in the routine of family or professional life. Additionally, with the proliferation of online matchmaking, where a profile photo often makes the first impression, more middle-aged people than ever are considering the clear benefits of a facelift. There’s no denying that dating these days, at any time in life, has become visually driven. In fact, you might not get the chance to even meet a potential partner in person if you can’t get past the profile page. So while it’s not a decision to take too lightly, there is certainly something to be said for finally being able to stop “Photoshopping” your Match.com™ picture and just come in to Dr. Smith to achieve your desired results. Cosmetic surgery patients who do just that usually find themselves projecting a whole new look (and confidence) in as little as two weeks, not to mention on their next big date. We also love stories of people, even into their 70s, who opt for a mini lift on the face. While this is past the typical age for a facelift, women in their 70s sometimes make the empowering move to commit to a mini cheek and neck lift. Why? Well often they’ve experienced the prolonged effects of estrogen loss and other signs of aging that show up in a sagging face. Mature people, many who remain active and social, are now permitting themselves to age more gracefully—and look as young and healthy as possible for their golden years. And we couldn’t agree more. 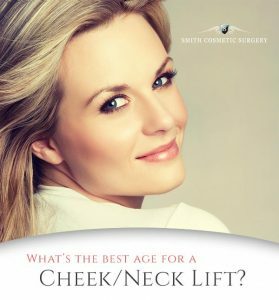 For all mini cheek and neck lifts at Smith Cosmetic Surgery, regardless of a patient’s age, we address the underlying muscles and tissues, bringing everything from orbital bone under eye down to clavicle, back up where it belongs. While Dr. Smith can’t “break the clock,” he has certainly turned back time with exceptionally natural-looking plastic surgery work. In most cases for older adults, he can help patients achieve a look at least 10 years younger upon healing from a mini lift. And that’s not temporary, but rather an outcome that seniors can maintain for the rest of their lives. So no matter your age, really there are no rules for when you should or should not have a mini facelift. Everyone’s motivation is different. Your plastic surgeon should understand both your impetus for a facelift, as well as how to help you achieve a desired yet realistic outcome. Remember, sometimes genetics come into play. Or maybe midlife circumstances changed in an unexpected way. Or perhaps you finally found the courage much later in life to do something you’ve always wanted to. The opportune time for a mini cheek and neck lift is … whenever you are ready. 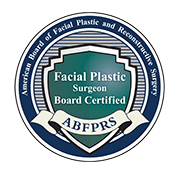 Interested in discussing your circumstances and desire for a facelift? 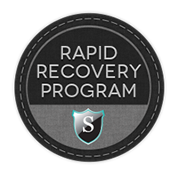 We are here for you and invite you into our office for a free consultation with Dr. Smith. Our computerized imaging program will generate a before-and-after model so you can feel great about your choice to commit to a facelift. Give us a call today.